Argentine Point – You never know what you will see at this dive site. Amazing numbers of southern stingrays in the US winter months, Eagle Rays throughout the year, great array of schooling fish and occasionally white-tip sharks. The top of the rock is only 10-12 feet and there can be quite a bit of surge, but incredible life and colorful juveniles hanging out there as well as Pacific tarpon, spade fish, grunts and horse-eye jacks. As you descend to the point at 80 feet there is no surge. Surprise – Located west of the big island and Aregentine Point this submerged dive site begins at 60 feet and is a large volcanic rock that if full of marine life. 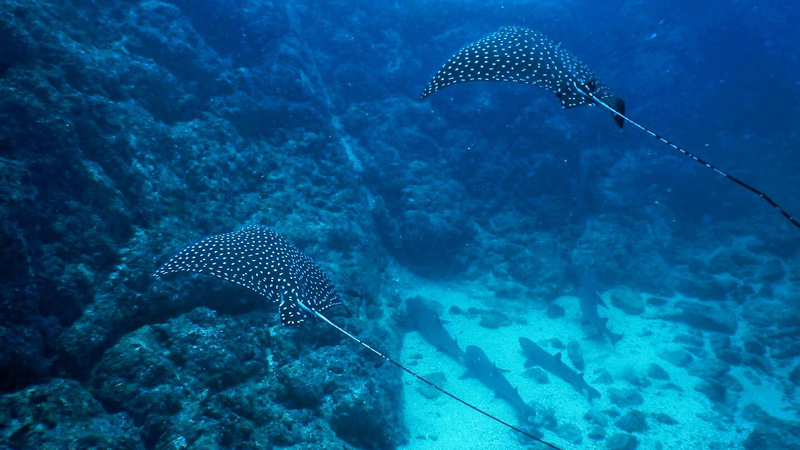 Famous for schools of spotted eagle rays and large amber jacks, it is a favorite for night dives & cup coral. There is a current here so you must go down and return by the mooring line. There is a smaller rock nearby in 105 feet that always has white tip sharks. Good spot for goliath groupers and an occasional whale shark. Monkey Head – This huge exposed rock pinnacle looks just like King Kong when you are beside it. Huge growths of cacti on the top of the rock make it look like Kong is sporting rasta hair. We have seen everything from large schools of eagle rays and jacks, small critters like seahorses or harlequin clown shrimp and even whale sharks and manta rays. Big school of Pacific tarpon (sabalo or milk fish) always hangs out on the south end of the rock. Punta Gorda – A great spot for macro photography. Everything from white-tips to frog fish. Several varieties of eels in rocks. One of the few sites with hard coral. Usually grunts, sergeant majors and stone fish everywhere. We have seen many golden cow-nosed rays on the site as well as sea-horses and occasional eagle rays. This is 15 – 20 feet deep on one side of the pinnacle and drops to 75-80 feet on the outside with most of the life at the top of the rocks. Bajo Tiburone – This is a great site for white-tip sharks. You can also see mobula and southern sting rays here. 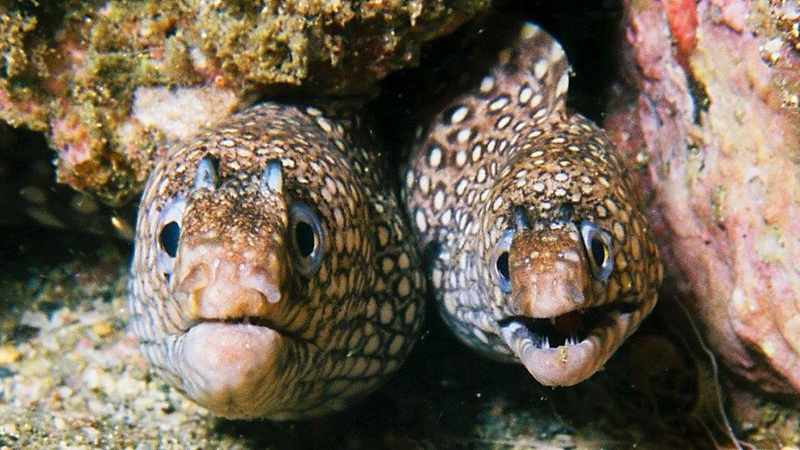 There are some crevices that house white-tips as well as squirrel fish. The top of the rock is at 20 – 30 feet, making the safety stop interesting. We have sighted 200 mobulas on many occasions on this site. There are 3 basic rock formations with sand channels in between. There are five rocks here leading out to the north at 70 feet. The last (5th) rock is called Big Surprise and is 100 feet in depth. Perfect for deep diving advance or specialty certification. Aquarium – This could not be a more aptly named site. Every fish that is available in our area has been seen here as well as turtes, tiger sharks and goliath groupers. The spiraling schools of grunts and yellow-tails are gigantic numbering easily in the thousands. The top of the submerged rock is 50 feet although we generally limit ourselves to around 80 feet, there are spots as deep as 130. Virador – This is a singular rock pinnacle measuring 20 feet on the front side and 70 feet or so on the back side. This is a large rock and most divers don’t make it completely around and will surface between Virador & Monkey Head. There are horse-eye jacks, butterfly fish, grunts, sergeant majors and many other varieties of schooling fish. 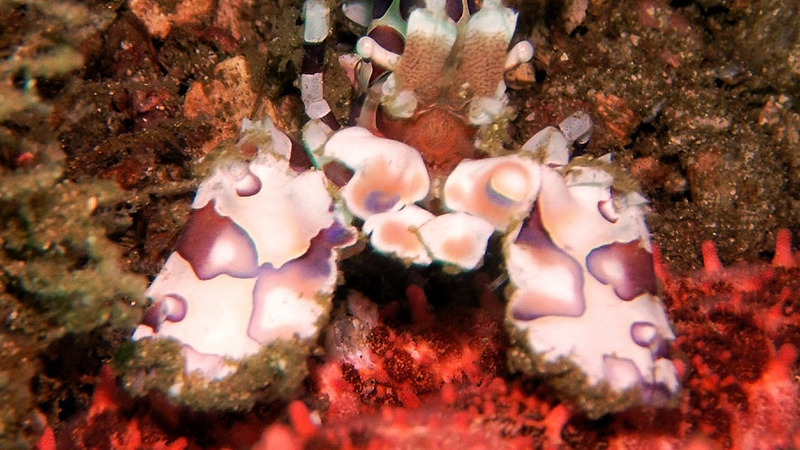 We have also seen the harlequin/clown shrimp here and several varieties of starfish. 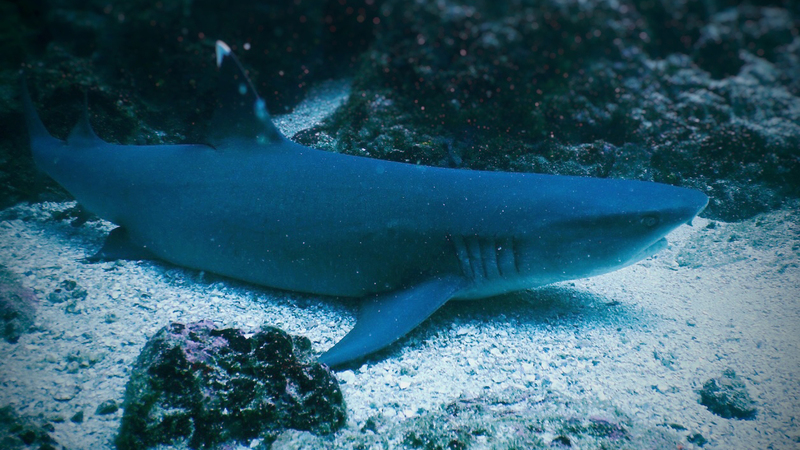 You may see white-tip sharks at 70 feet in the sand at the north tip of the rock, goliath groupers and turtles too. When you are back on the boat, keep your eyes open as there are usually mobula rays jumping for joy or to rid parasites, we can’t be sure which! Los Meros – This is a perfect place for a check-out or refresher dive as well as a great local dive. You will not see any larger schools of grunts on any other site we have. 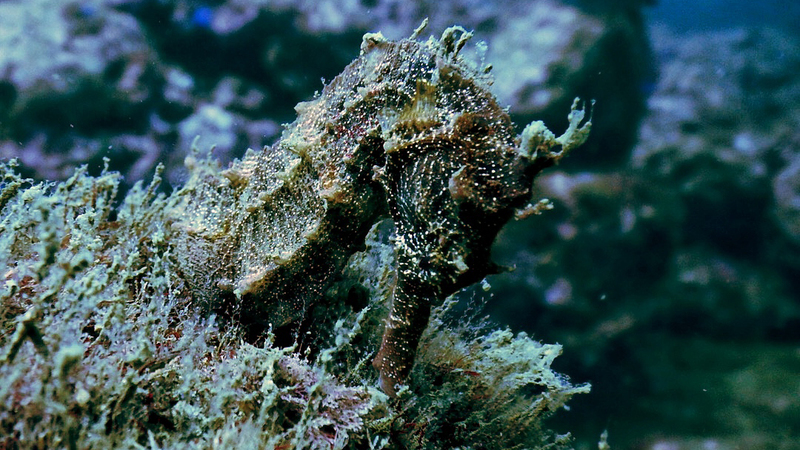 There also eel, octopi, sea horses, harlequin clown shrimp and nudibranchs. If you want to go deeper then 40 feet, you will have to bring a shovel. There are far too many sites to name them all, but this will give you an idea of some of our local sites. The sites are all volcanic rock formations and rock pinnacles. Punta Gorda – Punta Gorda never fails to please. With a maximum depth of 70 feet this is a great dive site for beginners and the advanced diver alike. Rolling off the boat you find the journey to the bottom on the mooring line is a short 25 foot descent. As you make the descent to the bottom you can expect the excitement to begin as hundreds of small colorful fishes school around the divers. We have seen schools of cow nose rays and Pacific tar. Transportation from your hotel, Tanks, belt and weights, fresh fruit and cookies, bottled water on boat.